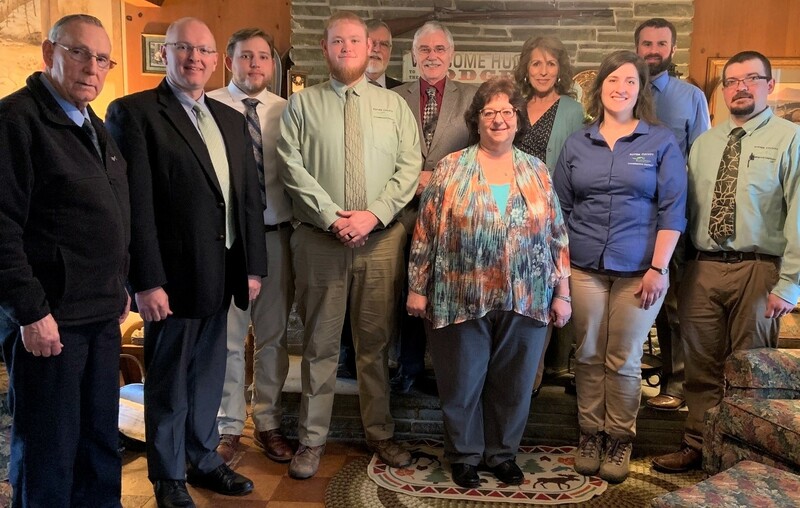 Potter County Conservation District’s annual legislative luncheon at the Susquehannock Lodge included an overview of the agency’s many works across the county, as well as a discussion of state government issues affecting rural counties. Potter County has the distinction of launching the first conservation district in the state. PCCD received a Pa. Governor’s Excellence Award last year for one of its environmental stewardship projects. Among those attending the luncheon were, from left: Earl Brown (PCCD), Rep. Martin Causer, Andrew Mickey (PCCD), Jared Dickerson (PCCD), Chuck Dillon (representing Sen. Joe Scarnati), Commissioner Doug Morley, Brenda Shambaugh (executive director of the Pa. Conservation Districts Assn. ), Commissioner Susan Kefover, Emily Shosh (PCCD), Jason Childs (PCCD), and Glenn Dunn II (PCCD). A summary of the district’s many accomplishments during 2018 can be found here.